1 serving of (Anything But) Simple Alfredo 1. 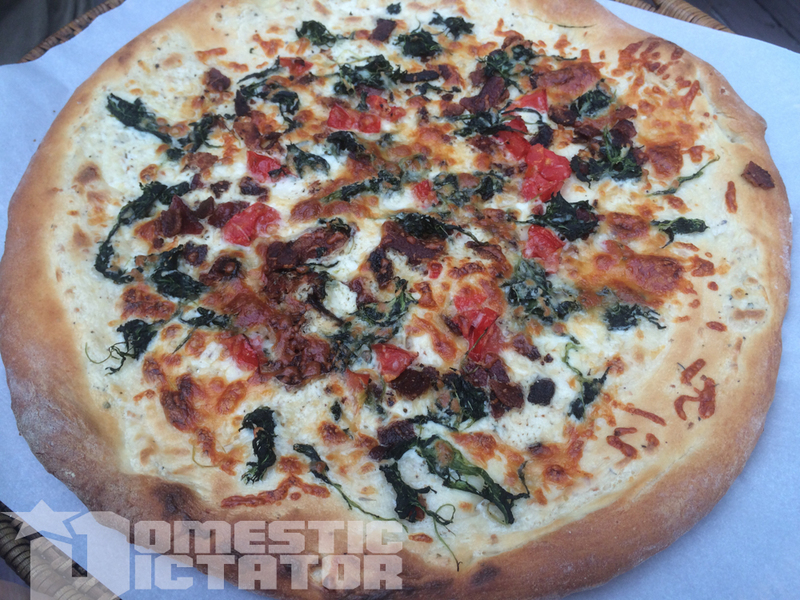 Preheat oven to 500° and place a large pizza stone in the middle of your oven. When preheat timer goes off, set an additional 30 minute timer - you want your oven as hot as possible! 1 pound of Pizza Dough 2. Allow pizza dough to come to room temperature. If it's been refrigerated, this will be approximately 30 minutes. 2 cups fresh baby spinach 3. Flour your work surface and roll dough out to 1-2“ inches smaller than desired size. 6 strips bacon, cooked and crumbled 4. Be brave, and give the dough a few tosses. Nothing too extreme, just enough to stretch out the middle and move the dough out a bit more towards the crust. Watch YouTube videos and feel good about yourself. 1 fresh roma tomato (or equivalently sized species) 5. Grease your pizza sheet (whether it's a screen or pan doesn't matter. Place dough on pan and move crust to edges, working gently. 1-2 cups fresh grated mozzarella 7. Add white sauce to center of dough, and spread out to edges. Create a nice even layer. 8. Sprinkle spinach over sauce, adding bacon and tomatoes on top of that. Top with cheese in desired quantities. 9. Bake for approximately 12 minutes, or until cheese is brown and edges of crust are as well. 10. Allow to cool for 3-4 minutes before cutting.